Fans of Stephen Colbert may have noticed his mysterious disappearance this week. His Thursday and Friday broadcasts of Late Night were replaced with repeats without explanation. The scheduling change was peculiar considering all of the current events that would be ripe for Colbert’s brand of satire. But now it can be told where he was and what he was doing. That toast obviously went out to folks like Michael Flynn, Jeff Sessions, and Jared Kushner, who all seemed to have trouble recalling the meetings they had with Russian operatives. Colbert was surprised that they would forget such lovely people. Of course, most Americans would have no problem remembering having met with agents of a hostile foreign nation. For some reason, Donald Trump’s associates have no problem forgetting. Repeatedly. 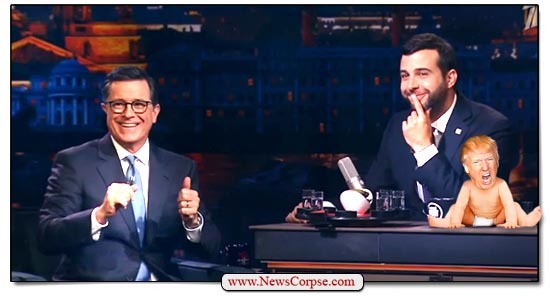 Colbert demonstrated his deft political sophistication by not bothering to wait until Russian spies captured and leaked this information. Why not just tell them personally? Although, for all we know Trump did the very same thing. With all of the contacts between Russians and his top advisers, they might have been working together to sink Hillary Clinton’s campaign. The only difference is that they collaborated in secret and lied about, while Colbert did it on live TV. So there you have it. The fix is in. In three short years the United States may inaugurate its first Comedic-American president. The crass ceiling will be broken. Given the historically low approval ratings for Trump, Colbert’s ascendancy to the White House can only be an improvement. After all, his approval ratings, as measured by the Nielsen Company, place him at number one. It’s too soon to know just when the next opening for a new president will occur. Trump is facing imminent peril for impeachment and prosecution for obstruction of justice and financial misconduct. But at the very latest, the next presidential election cycle for 2020 just might result in the inauguration of President Stephen Colbert. I can hardly wait.